Most of us have a short list of foods that we've not eaten since we were kids. These foods were so repugnant that our palettes were permanently scarred. Near the top of my short list are Brussels sprouts. So, this time out I thought I would tackle something that I've eaten exactly once before in my life. My kids have never had them, so it was also an opportunity to either add something to their short list, or to expand their culinary horizons. Brussels sprouts are mini heads of cabbage. But the problem with sprouts for me is that they're mini heads of cabbage. They taste like you took an entire head of standard cabbage and concentrated the flavor into something as small as a Brussels sprout. 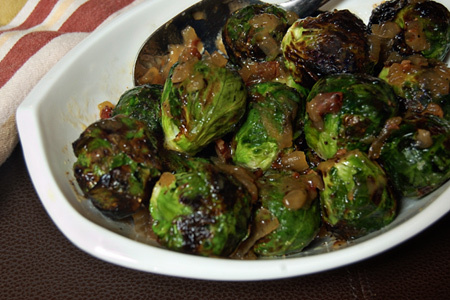 In my research for this adventure I discovered that roasting or grilling sprouts mellows that pungent flavor and brings out whatever modicum of sweetness they have. I've roasted broccoli and I can testify that it does make a huge difference. Given that broccoli is in the same botanical family I figured grilling would be a good approach. Even grilled, I felt that taming these little cabbage grenades would require something more. I did some flavor research and found that onions and bacon would likely be a great combination. This lead me to develop the onion and bacon marmalade that I posted earlier. In addition to the onion and bacon it brings a very welcome sweetness. How did it work out? Well, I'm happy that I gave the humble Brussels sprout a second chance. They were actually pretty good. The flavor was still strong, but not in the showstopper way that they were as a kid. Oh, and my wife and kids loved them. 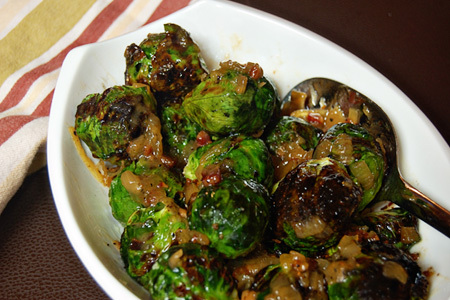 If sprouts are on your list, give these a shot. Note: The cooking method was inspired by Alton Brown's recipe. Start your grill and prepare for direct cooking over medium heat (350º). Trim 1/8" from the stem end of each sprout, and remove any loose leaves. Put the sprouts in a zip-top bag, seal the bag halfway, and microwave on high for 3 minutes. Mix the oil, salt and pepper with a fork in a small bowl, add the mixture to the bag and shake the bag gently to coat the sprouts. Pour the sprouts onto a platter and allow to cool until you can handle them. Skewer 4 or 5 sprouts through the stem end onto each metal skewer, leaving at least 1/2-inch in between each sprout. Grill for two minutes, roll each skewer 1/4 turn and grill two minutes more. Repeat twice more to grill the entire circumference of the sprouts. Microwave the marmalade for 1 minute at high to warm it. Remove the sprouts to a cutting board and cut each in half vertically. Put the sprouts in bowl and toss gently with the warmed marmalade. I happen to love these. I never had them as a kid but tried them as an adult and loved them. On my short list as a child was rice. The first time I had it, it was under cooked. I spent many years thinking rice was crunchy. I never tried them until last year. I wasn't crazy about them but I didn't grill them either. I'll give them another shot and try your recipe sometime. We're always looking for new ways to eat sprouts - the marmalade sounds very interesting.